Latecomer. Netbooks were a no-go topic for Sony for a long time. They did unleash two ultra-mobile mini-notebooks onto the market with the Vaio P11 and P21, but these discerned themselves strongly from the mainstream-netbooks already because of their comparatively high price. The good sales figures of many other manufacturers will have probably let Sony change their mind in the meantime. We present: The Sony Vaio W11 with a 10.1" display (1366x768) and an Intel Atom N280 CPU. Third dimension. 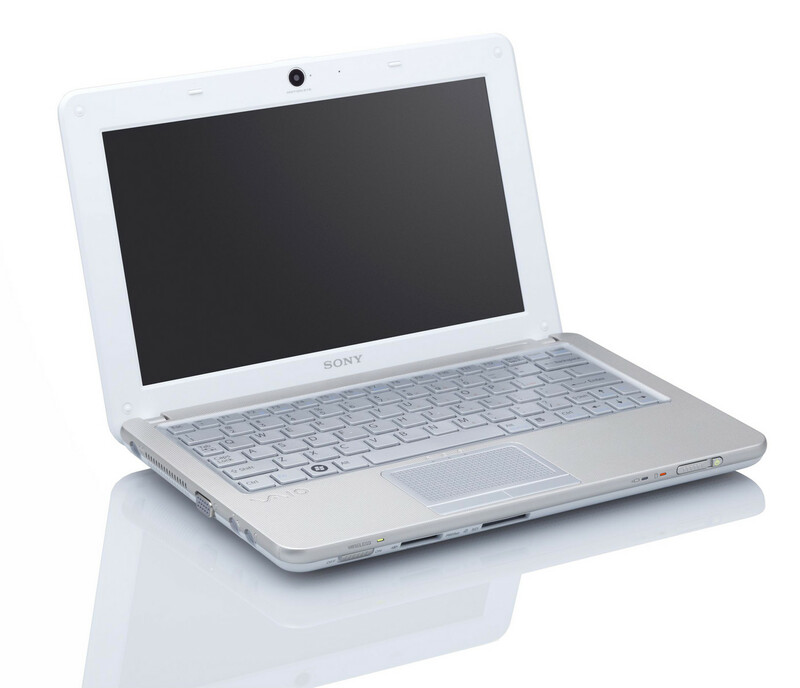 Sony implements its Bravia 3D technology in a notebook. Because of the decent viewing angels the picture you see through active shutter glasses is even good along the horizontal plane. Is this sufficient to justify the high list price of 1.999 euro? Sony invited to Munich on 23rd of March and introduced its new F-model. Sony finally enters the netbook race. The first proper effort at a netbook from Sony, the new VAIO W series, comes a long, long while after everyone else has already delivered their versions, comes in a bit pricier (as expected I suppose) but better designed (again, as expected). So it's beautifully designed, with a great screen, but over-priced and under-specced for the cash. So, in short it's exactly what you would expect from a Sony laptop. It also comes in white and pink if you feel you have to have a Sony if you're going to have a netbook. The Sony Vaio W scores mainly on its stylish looks, rich feature set and build quality. While its hardware configuration is similar to most netbooks, there are a few things that set this one apart. Unlike a plain Jane netbook, this one is quite an eye candy. The entire body follows a metallic color theme. Though the performance doesn't really set this one apart, the style factor would be the biggest USP for the Sony Vaio W. Available for Rs. 29,990. Sony has priced the W Series at £399 - low enough to keep it in netbook territory but clearly at the high end of the scale. Is it worth it? Sony’s attention to design and build quality is certainly in evidence, the X-black screen and superb keyboard going some way to setting the W Series apart from the crowd. Even so, we can’t escape the niggling feeling that Sony isn’t showing us how netbooks should be done, rather that they can be done with the VAIO brand. Sony's highly anticipated entry into the netbook market doesn't bring with it any real surprises or advances. But it does pack a uniquely Sony design and a superb high-resolution screen that make it a welcome entry into the crowded netbook market. Sony's first real netbook isn't revolutionary, but its superb screen and stylish design make it a worthy contender, so long as you don't need lengthy battery life.